Long ago and far away in the misty, moisty north country, there was a young and inexperienced cook who found a recipe for something called Panackelty. (It was in a rather grand scroll known to its readers as Vogue. The upper classes were prone to speaking in French in those days.) After slaving over a hot fire for quite some time, the cook proudly served her dish to local friends. Alas! The friends looked at her as though she was a lackwit and told her the dish was Pan Haggerty, something their humble grannies used to make for their teas when they were but children. And oh woe, the cook was such a simpleton she didn’t make enough either, so her friends went home sad and hungry. They probably had to stop at Ye Olde Chippe Shoppe on the way. Let’s fast forward to the 21st century before you lose patience, but rest assured my cooking skills and portion control have improved since the Dark Ages. It was Karen Burns-Booth’s authoritative post on Lavender and Lovage* about her family recipe that cleared up several decades of confusion on my part. 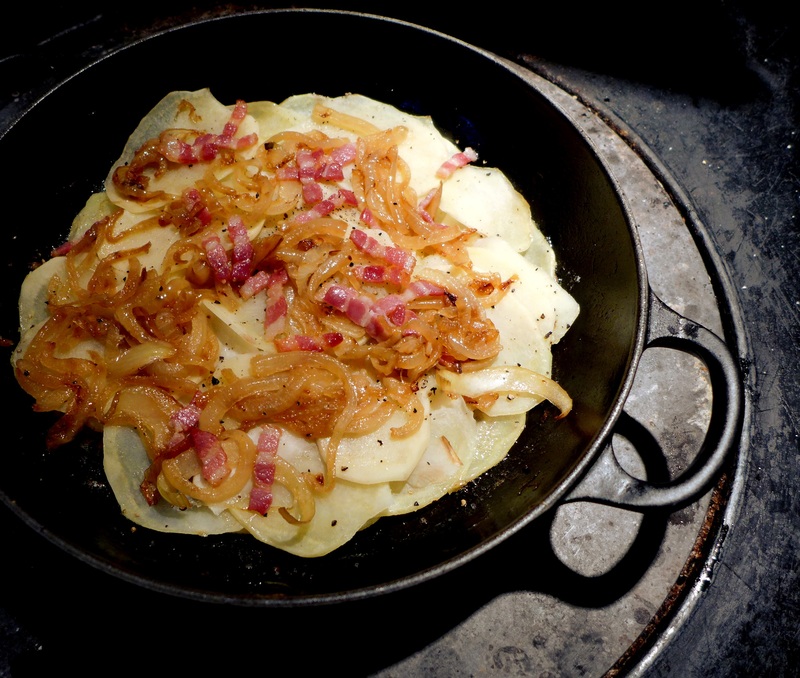 Pan Haggerty is a traditional North of England dish, which layers potato, onions and cheese to make a fabulously comforting and economical meal and is cooked on top of the stove. Panackelty, says Karen, contains meat and is finished in the oven. In some versions blanched cabbage is added. In a departure from tradition, you can mix up the potatoes with celeriac, if you like. 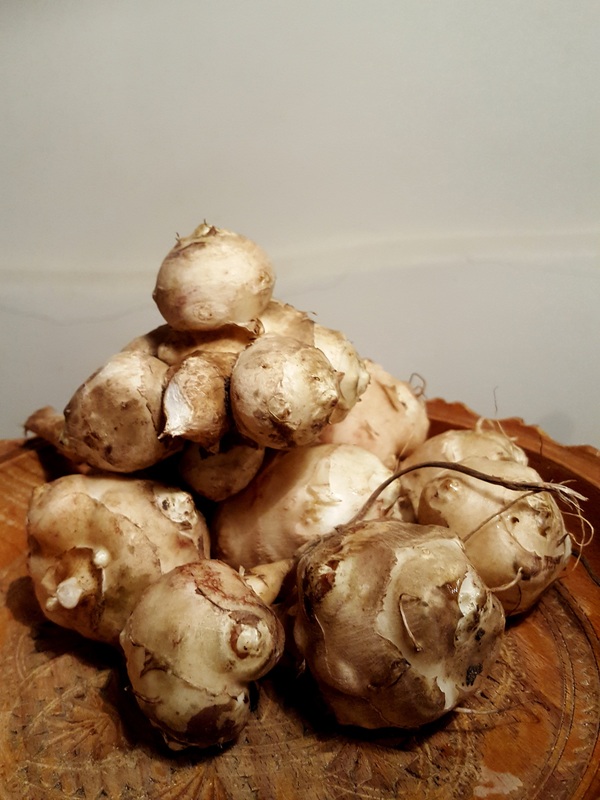 But I’ve got a garden full of Jerusalem artichokes (they spread madly if you let them) and I love their flavour in spite of their flatulence-inducing reputation, so I’ve included some here. Stick with spuds if you’re planning a romantic night in. I’ve included smoked bacon, which of course you can omit for a vegetarian option, in which case you might like to serve it with a poached egg on top or simply with a salad. It’s essentially a stand-alone dish but for meat eaters, Panackelty/Pan Haggerty, in all its variations, is very good with a few juicy chops or sausages. A diet recipe this is not. *Karen’s numerous fans will probably already know she has a new book out in time for Christmas, Lavender and Lovage: A Culinary Notebook of Memories and Recipes From Home and Abroad, published by Passageway Press. It’s a real labour of love and my review copy is already full of bookmarks. You’ll have to check out her blog, though, for her Pan Haggerty. In a large bowl, mix together the sliced potatoes and Jerusalem artichokes. In a heavy-based, deep frying pan, heat a splash of oil and fry the bacon until it’s beginning to crisp. Remove and drain on kitchen paper. Add half the butter to the pan and fry the onions until soft and golden. Don’t rush this step, they need to be properly cooked. When they’re done, remove them and set them aside. Melt the rest of the butter in the pan, arrange a layer of potatoes and artichokes on the base, season with salt and pepper and cook gently until they’re browned underneath. Remove from the heat and add a layer of onions and some bacon, then a scattering of cheese. Repeat, seasoning each layer of roots, until you’ve used everything up. End with a final layer of potatoes and artichokes and top with cheese. Place in the pre-heated oven and cook for 1 to 1 1/2 hours, or until the vegetables are soft when you poke a knife in, and the top is golden. Give it a quick blast under the grill if it hasn’t browned enough. Allow to cool for 10-15 minutes before serving in fat slices like a cake. This entry was posted in Mains, Vegetarian and tagged autumn food, cheese and potato bake, comfort food, pan haggerty, panackelty, panackelty with Jerusalem artichokes, potato and Jerusalem artichoke bake, winter food by Linda Duffin. Bookmark the permalink. 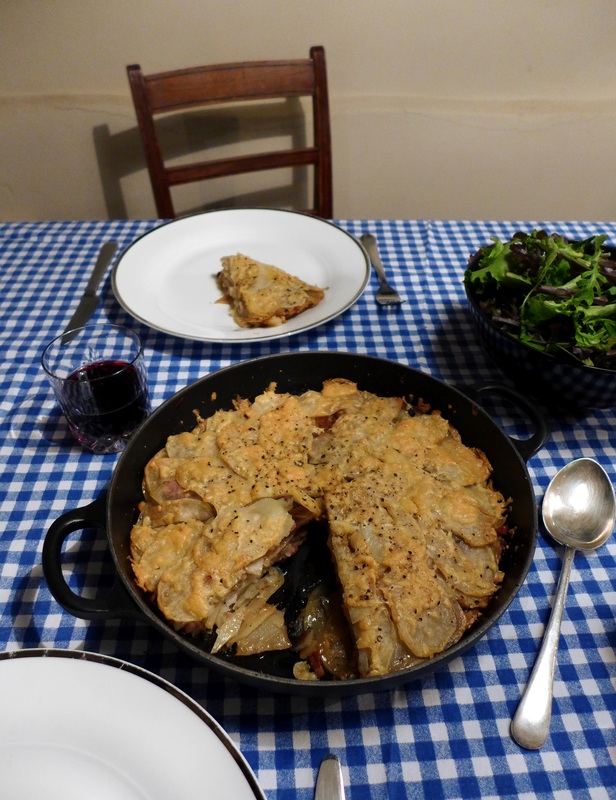 A great dish, but I have been banned from using Jerusalem artichokes, even though I love them…. *smile* The story of ‘Panackelty’ methinks is known and used over most of Northern Europe at least . . . well, perhaps the delightful Jerusalem artichokes do not always enter the fray !! . . . nice and filling especially if you add the cabbage . . . . Your sort of Panackelty sounds like a wonderful and comfy dish. Karen’s Pan Haggerty recipe is indeed very good, we’ve had it more than once. We love her new book Lavender & Lovage and our copy is full of bookmarks and notes as well. Season’s greetings Linda. It could probably go either way but did you choose to leave the bacon fat in the pan or remove that as well with the cooked bits? Thanks as always. Thank you, Frank. Bacon … one reason I would struggle to go veggie. A great bit of culinary education there Mrs. P. I had never heard of either Panackelty or Pan Haggerty. Great works. I really love Jerusalem artichokes, farts or no.